Claire Steels (centre) on the podium in Adelaide with Hannah Enoch (right) and Rebecca York. 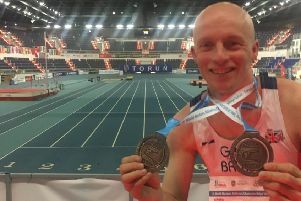 The Bourne Town Harrier member struck gold in the 25-29 year-old age group in a World Championship event in Adelaide, Australia today (October 18). It was her first outing for Great Britain. Steels covered the 5km run, 20km cycle and 2.5km run in 1.06.21 which was good enough for 10th place in the ladies race overall. She led home a 1-2-3 for GB as Harriet Enoch finished second and Rebecca York came third. “It’s a fantastic feeling,” Steels, a fomer captain of City of Peterborough Hockey Club, said. PACTRAC athlete Jim Fell finished 18th of 22 competitors in the men’s 65-69 event. He recorded a time of 2.48.08. Full report and pics in Thursday’s (October 22) Peterborough Telegraph and Friday’s (October 23) Stamford Mercury.